If you are looking for a great photo editing app with easy controls and a huge number of filters and effects, look no further than Autodesk Pixlr. This Windows 8.1 app gives you a huge number of effects, styles, borders and other edits that you can apply to your photos. The app is comfortable and easy to use regardless of if you are using a touch device or a mouse. It is my go-to editor these days and I recommend giving my review a read and trying it out for yourself. 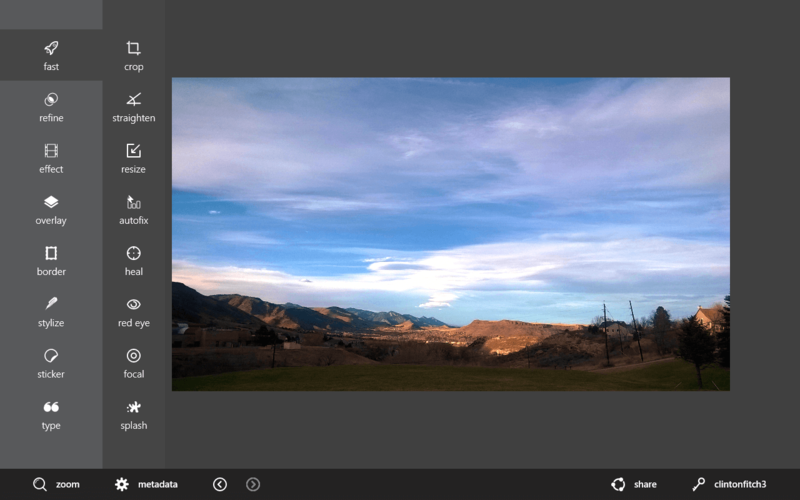 When it comes to photo editing apps for Windows 8.1, they come a dime-a-dozen (kind of like weather apps). This means in order to raise above the fray that the app has to be exceptional and feature rich. 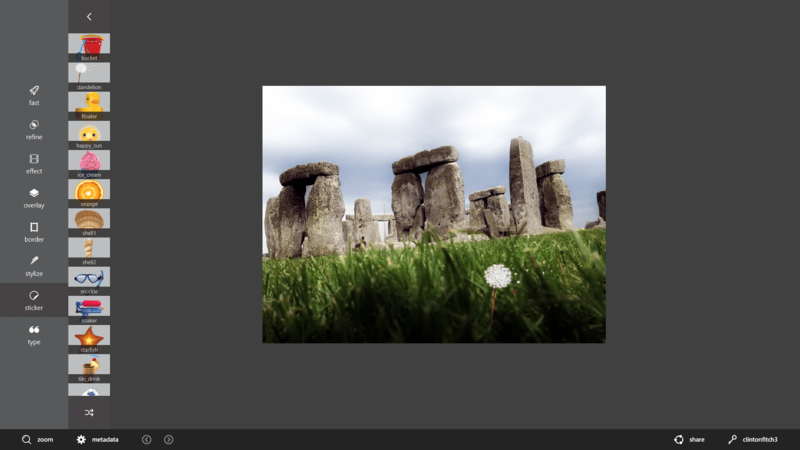 You get that with the recently released Autodesk Pixlr app for Windows 8.1. The Modern app gives you a host of editing functionality from the start with powerful auto correcting features to enhance your photos. The real power of the app comes when you sign up for a free Pixlr account. Then you can download literally hundreds of filters, frames, stickers and other effects to add to your photos. Autodesk Pixlr is easy to use and works comfortably on touch enabled tablets as well as mouse or touchpad driven laptops and PCs. It has become my go-to photo editing app on both my Windows PC and my Toshiba Encore 2 tablet and for the price of exactly zero dollars, it is hard to beat the value. installed and started you will see the first thing that makes this app compelling. 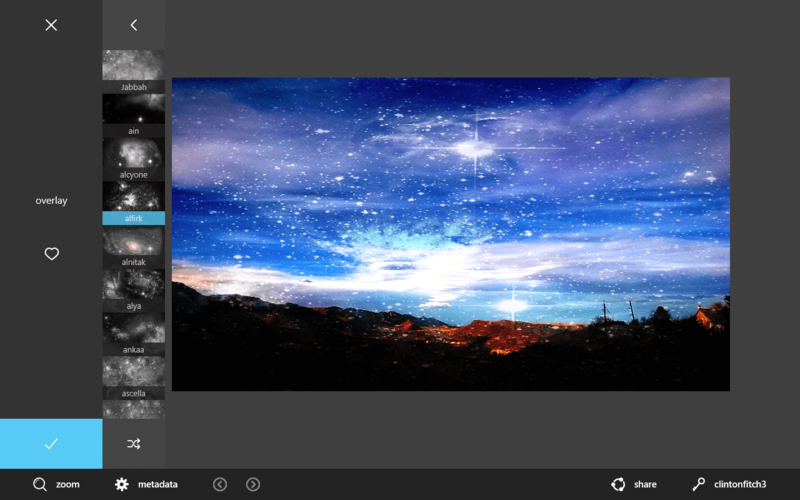 Autodesk Pixlr has a clean, simple user experience that is completely touch friendly. The main photo editing areas dominates the UI while the menus to access the different features of the app are located to the left. Tap on a menu item and it will bring up any sub-menus that might be there for that particular feature. Once you like the effect or other edit you have made to your photo, tap the check mark at the bottom of the menu to apply it. To save your photo just swipe down from the top of the screen to access the Save button. It is literally that simple. The menu in Autodesk Pixlr is divided up into 8 different sections, all of which allow you to edit your photos or add content to those photos. The Fast menu, as the name suggests, allows you to make quick edits to your photos. These include things like being able to crop a photos, straighten or resize it, auto fix the photos across both colors and clarity, reduce red eye or apply a tilt-shift focal point to your picture. There is also a splash feature which allows you to select a particular color in your photo and turn the rest to a black-and-white photo. If you are familiar with the Color Pop feature on the Lumia Creative Studio app on Windows Phone, it functions in a similar fashion. more color and contrast. This seems to be its strong suit. Related to this is the Refine menu. Here you can refine various elements such as color and contrast as well as sharpen, blur or smooth out a photo’s look. There is also a double exposure feature which allows you to mash up two photos into one. 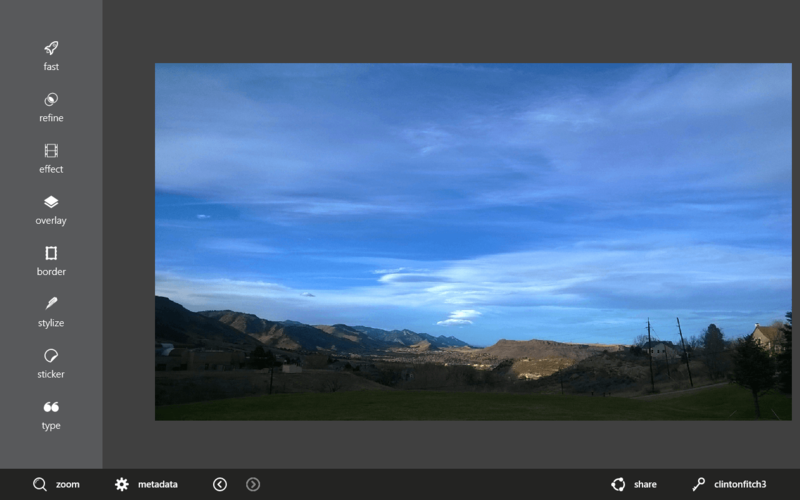 While the Refine menu is probably more than most people will need, it does speak well of Autodesk in their efforts to product a full fledged photo editor for Windows 8.1. I’m not suggesting that Autodesk Pixlr will replace every need a professional may have but it certainly can hold its own to a large degree. some impressive changes to what might ordinarily be a simple snapshot. As you would expect, the Overlay menu allows you to overlay elements onto your photos. You can add things like fireworks or flames and even constellations. Like the Effects, once you signed up for a Pixlr account you will have access to dozens of overlays you can add to your photos. What the Effects and Overlays menu can do for you is really up to your creativity and imagination. That is one of the things I like about Autodesk Pixlr. It doesn’t get in the way of your creativity. As you would expect, the Border menu allows you to add a wide range of borders to your photos while the Stylize menu allows you to change the style of your photo. For example, you can take a photo and turn it into a pencil drawing or watercolor. One of the limitations of the app is that you cannot apply more than one type of effect at a given time. So for example, you can add an Effect and a Style form the Stylize menu but you can’t add two items from the Stylize menu. For the majority of users this is no big deal but there may be times where you want to do a pencil-watercolor combination effect. You won’t be able to do that in Autodesk Pixlr but I think this is an edge case for most, not the norm. add text to your photos. That text can be in a range of different fonts in different sizes and colors. Having used Autodesk Pixlr as my primary photo editing app over the course of the last week I have to say I’m quite impressed with it. There are limitations for certain but none of them are major for the type of photo editing I do on a regular basis. I’m by no means a professional photographer or editor so for me, this app does the trick and it does it in an easy-to-use and simple interface. I highly recommend that if you want to give the app a try that you sign up for the free Pixlr account through the app. It opens up so many different effects, borders and styles in the app that it almost becomes limitless in what you can do with it.